A man is busily running in and out of an office in beach sandals. He takes 2 or 3 phone calls during just half an hour, and soon after, driving 15minutes to, running around with sprays through his factory, in which there are about 20 tanks of different sizes and those are exposed to sunlight. When he finishes taking a look at everything, he runs back to his car and goes back to his office again for one more conference or one more important document. This is Jun Hachiya’s everyday life. “Hachy” or “Hacchan”, as he is called affectionately by local people, is president of two companies, founded only four years ago when he was just 25. Even though this is not his hometown, Hachy has become a big man in the little town, Muroto. The first time Hachy came to Muroto was eight years ago, as part of a program in his 3rd year of Kochi University. Although going to Muroto had not been his choice, over time he has been transformed by the power of nature in Muroto. Muroto has everything he loves and this experience changed his life. As he had gotten to know Muroto’s charms, he decided to live there and conduct seaweed research under his professor. alized many problems as well as many charms. Although he frequently talked to local residents and could make good relations, most people were senior citizens and young people were very few. There are two main reasons for this. One is that local people have long believed that there were little opportunities for good jobs. Another is that the young generations don’t value what Muroto has. Since the Edo period in Japan (1603 ~ 1868), Muroto’s main industry has been fishing and agriculture. In 1960s, Muroto was prosperous in fish industry, especially tuna fishing and sold 9 billion yen in a year. However, for various reasons, like oil shock or operation of economic zone, the industry has lost its power as time passed. By 2013, the number of workforce was only 499 and it continues to decline. In agriculture, as well, the number of workers is declining. People find it too tough to make a living. Agriculture is very much affected by weather and requires constant attention to raise marketable crops. Moreover, Muroto is mountainous with a rocky coastline, which makes using machinery very difficult. That way of working is hard for people, especially the younger generations. Therefore, Muroto’s young generations leave their hometown to look for better jobs and only elder people remain. Now, Muroto’s population is only 13,970, which has been decreased by 4,010 since 10 years ago, and that number keeps decreasing. To make matters worse, 50% of population is over sixty. To solve those problems and make the situation better, Hachy founded his first company, Umiji, in 2013. 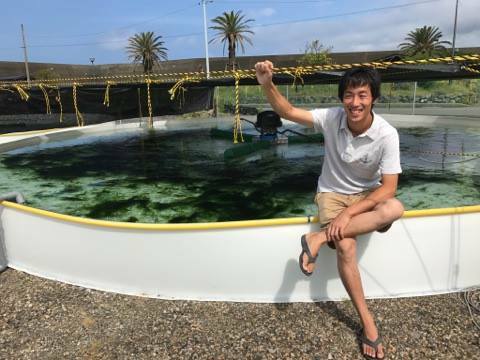 His main idea to process normally unmarketable fish into sellable products and to cultivate “aonori”, or “green laver” on land using deep sea water. This had been his research topic in university. He gathered money to make his factory and sell his products. In recognition of his success, he received city council’s financial support and he started hiring a regular staff and 3 part-time workers for the first year. In addition to his main industry, he and some like-minded friends held BBQ party using local products in order to raise local pride and awareness of the charms of Muroto. In that event, local farmers, fishermen, city hall officers and the young generation gathered, to build community and take pride in Muroto’s charms. After that event, he met people eager to work with and learn from him. One such convert is Hajime Imazu from Kochi City. From Hatchy he is learning about communication with others, about ways of running a company and how to form relationships with a local community as well. Hajime is now an owner of Geo café, which includes a souvenir shop, and is located in Muroto Geo park center. He actually tries to connect customers to farmers or fishermen and serves foods with ingredients they produce. Hachy now employs three regular employees and about eight part-time workers, most of them from Kochi prefecture with work experience in other prefectures or big cities. Through this article, I learned that Hachy really loves the place Muroto, and he inspired lots of people. I like your rhythmical expression on your article, such as ” a big man in the little town” . Very interesting one. This is pretty good story about a man tried to change Muroto and let people realize how Muroto is good. It’s very interesting for me. This article makes me more energetic. People now should think about localisation to know more about cultures. Hachu helps this and is able to inspire many people in Muroto. Thank you for giving interesting story. I learned about Hancy, and the place Muroto, too! I can learn how Hachuda loves Muroto. His passion moved many people’s heart and improved Muroto! Great article!! Hecht is indispensable for Muroto. Great article!! Hachy is indispensable for Muroto.